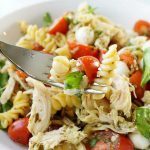 10 Minute Chicken Caprese Pasta Bowl - a delicious meal the whole family will enjoy and a perfect weeknight meal! Slice the tomatoes in half and place them in a large bowl. Next measure out about a cup of spinach. Run your knife thru it so it's cut into small bite sized pieces - place into the bowl. Next in a small bowl, add two tablespoons of Barilla Pesto Sauce and one tablespoon of olive oil. Mix it together well. Microwave the pasta and add it to the bowl. Mix with the pesto sauce, serve and enjoy! Pine nuts are optional - if using toss a handful on top of the pasta prior to serving.